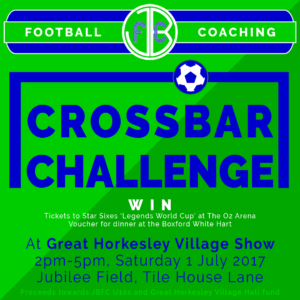 On Saturday 1 July we’ll be running the JBFC Crossbar Challenge at Great Horkesley Village Show. Come along and join us at Jubilee Field, Tile House Lane, from 2pm to 5pm. We will have some great prizes up for grabs for those taking part in the JBFC Crossbar Challenge. We’ll have two JBFC Crossbar Challenge competitions; one for U11s and one for over 11s and adults. The top scorers in each section will walk away with a fabulous prize. You can win a voucher for a meal at the Boxford White Hart, shirt sponsor of our JBFC U10s, or tickets to Star Sixes at The O2 Arena this summer. Star Sixes is a ‘legends World Cup’ six-a-side competition, which takes place from 13 to 16 July. It will feature a host of world stars, including Steven Gerrard, Rivaldo, Alessandro Del Piero and Robert Pires. All proceeds raised from the JBFC Crossbar Challenge will be split between the JBFC U10s team, as they embark on their first season in the league, and the Great Horkesley village funds. As well as the JBFC Crossbar Challenge, there will be a host of other stalls and activities including dog agility, hog roast, and lots of fun for all the family. This entry was posted in football coaching, JBFC and tagged coaching, crossbar challenge, football, great Horkesley, jbfc, jbfc crossbar challenge, prizes, soccer, village show, win. Bookmark the permalink.